Jakarta, dpd.go.id – Corruption Eradication Commission (KPK) as an Indonesian anti-corruption institutions is under pressured by many sides. KPK is seen as half-hearted and selective in combating corruption. Even some people propose the dissolution of the KPK and return the task of eradicating corruption to the police and judiciary. I Wayan Sudirta (DPD PPUU Chairman / Senator of DPD Bali Province) firmly rejected the proposal. He still strongly believes that the Commission could do their job if the strengthening of institutions is done. 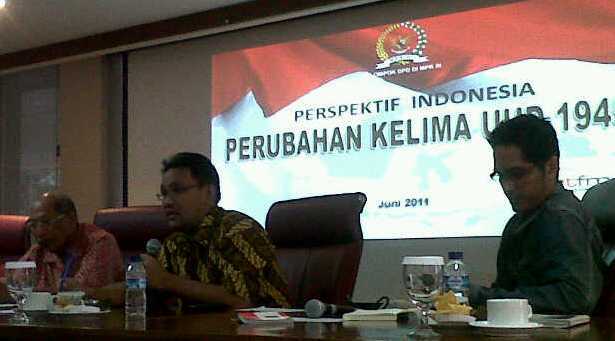 It was said by Wayan in Talk Show of Perspective DPD at Pressroom DPD Indonesia in Senayan, Jakarta (24/06/11). In a talk show entitled “KPK and the Law Enforcement through the Fifth Amendment of the 1945 Constitution”, in addition to the strengthening of the Commission, Wayan proposed five commissions that should be included in the constitution. “If the KPK, KPU, KY, IBC and Komnas HAM is set in the 1945 Constitution, our nation will become a civilized nation,” said Wayan. That was supported by Teguh Santosa (Chief Editor of Rakyat Merdeka Online) who stated that he agrees to the strengthening of KPK as a permanent commission. He added, “Our country has become a state of ‘ad hoc-cracy’ because all issues are resolved by the temporary agencies,” he said. In line with that opinion, Febri Diansyah from ICW (Indonesian Corruption Watch) also questioned why KPK as a special anti-corruption agency is only regulated in the Law. Thus, he argues, the existence of KPK needs to be regulated in the constitution. “The law on KPK is the most frequently law experiencing judicial review. It is recorded that 11 of the 13 applicants wanted to cripple the articles in the law,” Febri explained.